The 2016 Carr Pinot Noir, Pommard is a single-clone Pinot Noir from the Yard Vineyard in Sta. Rita Hills. With flavors of vanilla cola, ripe cranberry, and black pepper this is an truly unique and delicious Pinot Noir. 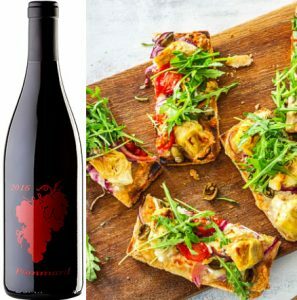 With a long lasting finish that just won’t quit, this wine deserves to be paired with foods that has flavors that are just as bold to compliment it. Try it with these Greek salad-style flatbreads for a fun and tasty experience! 1. Adjust oven rack to upper position and preheat to 425ºF. Rinse and drain artichokes, then cut them into halves through stem ends. Cut the olives and tomatoes in half lengthwise. Halve, peel, and thinly slice onion. Mince or grate the garlic. 2. Tear the mozzarella into small pieces with hands. 3. Place the flatbreads on a lightly oiled baking sheet. Spread out the mozzarella in an even layer over the tops of each flatbread. Scatter the olives, artichokes, tomatoes, and feta cheese over tops, followed by as much onion and garlic as you like. Season with salt and pepper. 4. Bake the flatbreads in the oven until the crust is crisp and the mozzarella is melted, about 8 minutes. Remove from oven and set aside. 5. Toss the arugula in a medium bowl with the balsamic vinegar and a drizzle of olive oil. Season with salt and pepper. Scatter the arugula over flatbreads, cut into slices, and serve.